This item consists of 9 parts total. This kit/set/ pack contains one each of the following parts. WASR AK Semi auto trigger, , WASR AK Semi Auto Hammer, WASR/AK Semi Auto disconnector/sear, WASR Slave pin, and 2 WASR AK trigger Axis Pins, trigger sleeve, hammer spring, and a cut off thread protector. 9 parts total. . These parts are taken off of new imported single stack rifles that are converted into 922r compliant rifles. 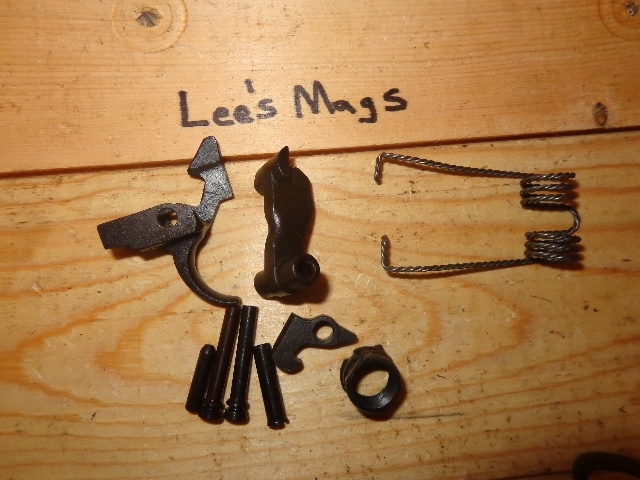 These are new take off Semi automatic trigger parts. The parts may have minor nics and scratches from being dis-assembled. this is a great deal!